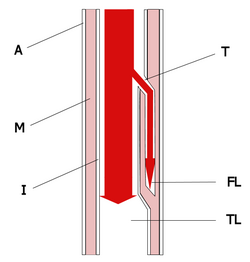 As with all other arteries, the aorta is made up of three layers. The layer that is in direct contact with the flow of blood is the tunica intima, commonly called the intima. This layer is made up of mainly endothelial cells. Just deep to this layer is the tunica media, known as the media. This "middle layer" is made up of smooth muscle cells and elastic tissue. The outermost layer (furthest from the flow of blood) is known as the tunica adventitia or the adventitia. This layer is composed of connective tissue. In an aortic dissection, blood penetrates the intima and enters the media layer. The high pressure rips the tissue of the media apart, allowing more blood to enter. This can propagate along the length of the aorta for a variable distance, dissecting either towards or away from the heart or both. The initial tear is usually within 10 cm of the aortic valve. 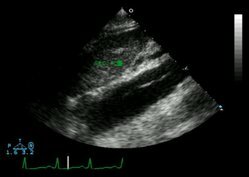 Type II â€“ Originates in and is confined to the ascending aorta. 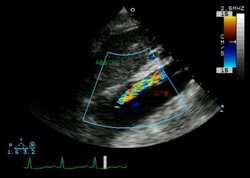 Type III â€“ Originates in descending aorta, rarely extends proximally. The incidence of aortic dissection ranges from 5 to 30 cases per million people per year, depending on the prevalence of risk factors in the study population. Vocal fold paralysis in painless aortic dissection (Ortner's syndrome). (Imaging Clinic). Study objective: Laboratory testing plays a minor role in the assessment of aortic dissection. Its main value is in the exclusion of other diseases.